The Board of Supervisors for the University of Louisiana System today honored student member Adam Lefort for his year of service on the board. 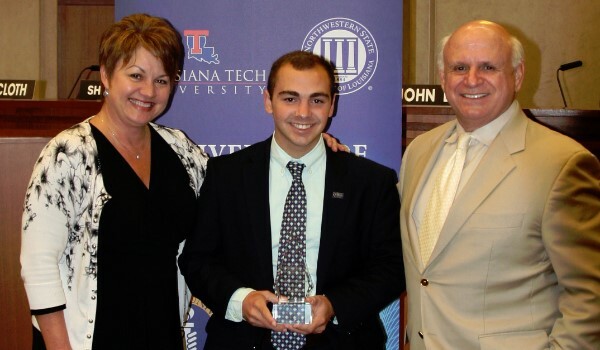 A senior political science major at Nicholls State University, Lefort represented 89,000 students from the system’s nine universities and served on two presidential search committees. Board Chair E.G. “T-Boy” Hebert also lauded Lefort. “I would like to express my sincere gratitude for the time you have served. I know you have a bright future,” he said. Today, the University of Louisiana System reactivated its Academic Program Discontinuance Policy as a precautionary measure in case the worst case scenario happens with higher education’s budget. “This is one of many tools the campuses may need to use should the 83 percent budget cuts become a reality. We do not want to cut programs, and that is why there are budget triggers built into the policy,” said Woodley. The policy was revised in 2013 to include budget triggers in anticipation of large budget cuts, but it sunset on June 30, 2014. The triggers are a 15 percent reduction of state appropriations for the next fiscal year or a 7.5 percent reduction in mid-year. Search consultants for the Grambling State University Presidential Search will submit their recommended candidates by May 27, in anticipation of the search committee meeting in Baton Rouge on May 29 to select semifinalists to interview for the position. Interviews will take place the week of June 1 on Grambling’s campus in North Louisiana. Plans are also underway to hold a special Board of Supervisors meeting on Grambling’s campus at the end of the week to select the new president. To keep up with the search, visit www.ulsystem.edu/GramblingSearch. McNeese: approval to rename the College of Nursing to the College of Nursing and Health Professions..
McNeese: approval to award an Honorary Doctor of Humane Letters to Mr. Oliver G. “Rick” Richard at the Spring Commencement Exercises. Southeastern: approval of a Proposal for a Post Baccalaureate Certificate (PBC) in Accounting. Southeastern: approval of a Proposal for a Post Baccalaureate Certificate (PBC) in Business Administration. UL Monroe: approval of a Proposal for a Bachelor of Arts degree program in Organizational Leadership. UNO: approval to merge the Department of Management and the Department of Marketing in the College of Business Administration. UNO: approval of a Proposal for a Master of Higher Education degree program. UL System: approval of a resolution authorizing the Board Chair and System President to negotiate and sign a consent agreement with the Louisiana State Board of Nursing. Grambling: approval of a contract with Ms. Nadine Domond, Head Women’s Basketball Coach, effective July 29, 2015. Grambling: approval of a contract with Mr. Shawn Walker, Head Men’s Basketball Coach, effective July 29, 2015. Southeastern: approval of a contract with Mr. Jason Hayes, Head Women’s Tennis Coach, effective June 1, 2015. Southeastern: approval of a contract with Mr. Chet Pobolish, Football Offensive Coordinator, effective July 1, 2015. LA Tech: approval to allow properties in Lincoln Parish to be nominated to the State Mineral Board for mineral lease. Specifically, the University has been requested to allow the Biomedical Engineering Tract containing approximately 4.46 acres to be nominated for lease. Nicholls: approval to lease approximately 151 acres of land located at the University Farm at Lafourche Crossing, on Hwy. 1 east of Thibodaux, Lafourche Parish, Louisiana. UL Lafayette: approval to develop and implement Tier II of the University’s Athletic Master Plan including additions and renovations to M.L. Tigue Moore Baseball Stadium utilizing Ragin’ Cajun Facilities, Inc. (RCFI), a 501(c)3, not-for-profit corporation. UL Monroe: approval to name certain areas within the Liew Family International Student Center the John W. Wong and J.W. Wong Knowledge Enrichment Foundation Social Center in honor of Mr. John W. Wong as well as the authority to name other areas in the future. Grambling: approval to place a monetary referendum on a Student Election Ballot re Choir and Visual Arts. LA Tech: approval of an Affiliation Agreement between the University and Louisiana Tech Research Corporation. McNeese: approval to reorganize the Division of Business Affairs and University Services. Nicholls: approval to implement a per credit tuition amount ($250) all inclusive for the Community College of the Air Force (CCAF) General Education Mobile (GEM) Program. UNO: approval of resolution authorizing and providing for the incurring of debt and issuance of $3,580,000 in aggregate principal amount of the Board of Supervisors for the University of Louisiana System Revenue Refunding Bonds Series 2015 for the benefit of the University of New Orleans, payable solely from Dedicated Revenues; approving and confirming the sale of the Series 2015 Bonds and the application of the proceeds thereof; and providing for other matters in connection therewith. UNO: approval to use the proceeds of the sale of the UNO Jefferson Campus to (1) retire the portion of the bond debt associated with the Campus and (2) use the remaining proceeds for the University’s operating expenses. UL System: recommendation to approve Campus Housing and Meal Plan Rates, Auxiliary Rates, Energy Surcharge, and Non-Governmental Charges for Academic Year 2015-16. LA Tech: approval to appoint Dr. Christopher Martin as Dean of the College of Business effective July 1, 2015. LA Tech: approval to appoint Dr. Gary Kennedy as Dean of the College of Applied & Natural Sciences effective June 1, 2015. UL System: request to certify campus LA GRAD Act reports for 2014-15 and further authorize the System President to certify adjustments to the reports to final submission to the Board of Regents.